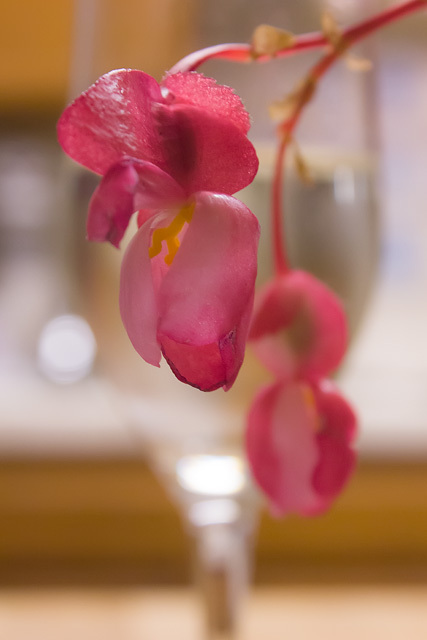 The superposition of the flower against the champagne flute caught me eye immediately when I glanced over to the kitchen counter. I can’t always explain why I find a particular composition appealing, but this one really attracted my attention. Perhaps I shouldn’t spoil it by trying to be too analytical. However, let me use this opportunity to say a few more things about depth of field (DOF). DOF is the range of distances from the camera at which objects are going to be reasonably sharp in the photo. DOF is affected by a number of factors, including the aperture and the focal length of the lens. Larger apertures (smaller f-stop numbers) and longer focal lengths will result in less DOF. Here, we have a middle-of-the-road aperture (f/8) and focal length (55 mm), and yet the depth of field is very shallow. The reason is the third and often strongest factor in the DOF equation, namely the distance to the subject. DOF can be remarkably shallow at close distances. Here, the focus distance to the flower was about 10 inches, so even though the glass was only a couple of inches further away, it is already rather out of focus. The rest of the background, which is just a few feet away, is pretty much unrecognizable. That’s a good thing, because the cluttered kitchen counter in the background really would have been distracting if it hadn’t been so out-of-focus. This entry was posted in Picture of the Week and tagged canon eos 60d, nature, photography, plants, still life. Bookmark the permalink.